As someone who is oversensitive to touch, I find headphone to be painful. I can't wear an "on-hear" headphone and even the "around-hear" can be painful if I wear them for too long. Worst, if I need to use my glasses at the same time (to be on the computer for example), I'm unable to do so because of the pain. I'm also oversensitive to noise (but less than to touch) and I would like to have some solution to "cancel noise" in everydays situations (in the open space, in a crowded place, etc...). Due to my oversensitive touch, a noise-canceling headphone isn't a solution. However, I think something similar to an Ostrich Pillow could be a solution (but not the real version since I want to be able to see things). So, I was wondering if you had some DIY tutorial I could follow to make a comfortable noise-canceler (or just a product that fit my need I could buy)? It doesn't need to be for making some kind of Ostrich Pillow, I'm open to other solution as well. I'm also open to solutions for a noise-canceler that you can't easily cart around and who isn't supposed to move after you have installed it (for an open-office scenario for example). Earphones are even worst than on-hear headphone and, for this reason, I'm pretty sure earplugs won't do. I hate slim and believe they are the most uncomfortable thing ever. For this reason, I only wear large trousers (and cloth in general). Tights are awful, they feel too weird and I can't focus on anything else while wearing them. I don't use nail polish on my fingers because the sensation of having this on my fingers feel too weird (but my toes are fine with nail polish). I don't tie my hair because "they don't like" being bent another way. And, when I do tie them, it becomes painful after a time. The top of my head. I don't mind wearing a hood and winter cap are fine (but, strangely, sun cap are less fine). My shoulders. I'm used to wearing a backpack and so, I believe that something who would weigh on my shoulders will be fine. My ears are the most sensitive part of my body and anything putting pressure on them is a big no (I even have a system to be able to sleep on the side without my ears touching the pillow). 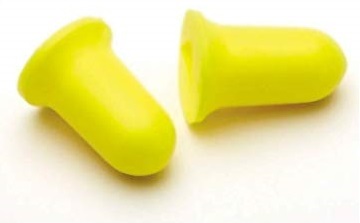 Would simple earplugs help? There are a variety of designs, including memory foam plugs that gradually expand in your ear. You may be able to find a set that fits gently and doesn't bother you. Sense tend to adjust; the more you try to spare them the more acute they become. If your sensitivity to sound isn't that bad (if it is just unpleasant, but doesn't give you headaches, for example) I really wouldn't advise you to block everyday noise. This would make your sensitivity even worse eventually. Use noise-cancelling directional loudspeakers (once available). I looked into this technology around 2010 when I tried to find a noise-cancelling solution for a friend who had to sleep in a noisy environment. There were some scientific studies and experiments, but no products for "noise-cancelling speakers". Maybe you have more luck now, but I'm not aware of any ready-made products yet :( I found only a working prototype called SONO. It was presented in 2013, but is not available on the market yet. Also it's not a directional loudspeaker but meant to filter / cancel noises coming in through glass windows – but it would be a partial solution already. If the only issue with the ostrich pillow is that you can't see, why don't you just cut eye holes into it? Not the answer you're looking for? Browse other questions tagged comfort sound or ask your own question. How to lessen / dampen the noise of creaking floor boards? In ear headphones are painful to wear, increase comfort or convert to earbuds somehow? How can I soundproof my room (or part of it) so I can sing without annoying my roommates? How to make sure I can't be heard by neighbours (without asking them)?